Tell us a little about yourself Hari, we would love to know more. I’m a mum, a wife and run the Hari Ghotra website to get people excited about cooking great Indian food from scratch. This includes cookery classes, videos, blogs, my curry kits range and so much more. You did pop-ups, supper clubs, trained at the Michelin starred Tamarind, and now you have your own cooking empire. How did that come to be? It all started when I began to teach people how to make Indian food at home from scratch. Talking to people about spices and the process of cooking Indian dishes seemed to help others create the food they loved without having to opt for takeaways. I have always loved cooking and hosting, so very quickly my classes were taking over my life. At the time, I was still working full time as a marketing manager at Tesco, I had two small children and a husband who travelled and it all became too much. There was only one of me and a huge demand for my classes so I started to work with a digital marketing agency called Jellyfish who helped me turn my cookery classes on their head so I could increase my reach. We created the Hari Ghotra Brand with a view to reach a bigger audience through having a strong online presence through various digital platforms. The website was born featuring hundreds of recipes. The YouTube channel was created with lots of recipe videos both long and short, hints and tips videos too. I cooked at pop-ups and supper clubs and before I knew it, I was working in London at a top restaurant. The ability to train in a Michelin star restaurant was an amazing experience and helped me understand the restaurant world and restaurant food too. 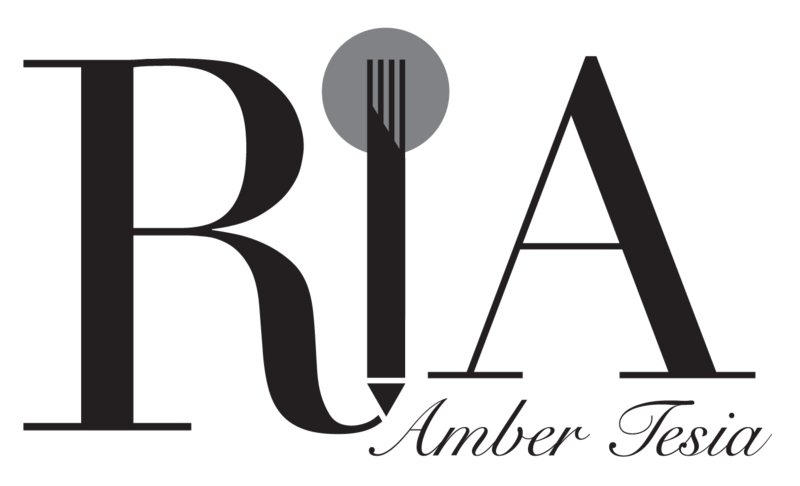 Everything I do is about helping others to cook authentic Indian food and that’s the focus of the business. How would you describe your food journey? I learned to cook at home with my mum because that’s what we all did. Cooking and eating as a family was just part and parcel of life growing up in an Indian home. Cooking and food was never meant to be a career but food did feature in everything I have ever done. Being able to work in a field that you love is an amazing thing. After years of being in the corporate world, I decided to take the plunge and with Jellyfish’s help we set about creating a digital brand that would become the one stop place for everything Indian food related. From the cookery classes I taught in people’s homes, I now have the number one digital Indian food platform in the UK, a website that is getting a crazy amount of traffic, a range of curry kits designed to help people cook Indian food from scratch (that we are also talking to a major retailer about), have trained at a Michelin starred restaurant for two years, launched an app, and have a book launching in September. Not to mention the demos at huge events like Carfest, and the food networking events I host at the Shard. So, all in all, it’s been pretty amazing. How do you want people to feel when they’re tucking into creations from your recipes they made at home? I love hearing from people who have cooked and tried the recipes – it’s an amazing feeling to know that there a people all around the world cooking the dishes my mum taught me to cook. My new app has highlighted how far and wide the recipes have reached, and I frequently get sent pictures of people cooking my dishes from New Zealand to France to Dubai. I want people to feel proud of putting a homemade delicious meal in front of their families – I want them to feel passionate about the ingredients they have cooked with and I want them to feel like they have learned something too. Have you always been passionate about food? How can you not be? Food isn’t just about filling your tummy, it isn’t just about sustenance – it’s about bringing people together, it’s about community, it’s about sharing, it’s about love! What would you say to someone who loves cooking and wants to bring it to a larger audience? I’d say do it. What’s stopping you? You don’t have to make any big commitments or spend any money to start with. There are so many options you can start off doing small supper clubs in your home and grow from there. Start with people you know and the word will spread and your audience will grow. Can confidence in the kitchen be learnt, and if so, how? Have you always been a super confident, cool presenter? I have worked and cooked with many people over the years and I still think everyone can cook. The more you do something, the more relaxed you become at doing it, you start to learn the processes and your confidence grows. It’s igniting that flame that we need to get better at doing as a nation. If you teach kids the basics, they will become interested in the other stuff. I’m not sure about super confident but I’ve always been of the mindset that you just get on with it, what’s the worst that can happen? I’d never been in front of a camera until three years’ ago. But it’s the people bit, the classes and demos, the interaction that I love, so talking to the camera is just the same as speaking to another person, right? What do you prefer – cooking, or writing about cooking? I will always say cooking because when you cook, you get to eat and I love to eat. I also love to give people food, I love to hear their reactions, to see their facial expressions and hear what they have to say. When you love to cook and you cook for the same people all the time, they get used to you and their reactions become less obvious so, as a cook, you always feel like you need to grow your audience, so you can feed off those reactions. When I write, I struggle to motivate myself to start. I always have a feeling of what do I know that anyone else is going to enjoy or learn from? But once I get going I’m off and I love it. I love to research and find out new things about food, trends, history and where dishes came from and how they’ve evolved. On your website, you say that you’re “potty about spices”. What is it about spices that makes you giddy with happiness? I think it’s about the wonder of nature. The world we live in is a beautiful place and we have the most amazing food sources all around us. We take so much for granted but when you think these simple little flowers and plants that produce the most amazing things from fragrant bark, aromatic seeds, sweet pods, nuts and fruits, it is mind blowing. What’s even more amazing is how they have come to be used in the medicinal and culinary world for centuries. There is so much you can do with spices to add aromatics; you can boil them, toast them, cook them in oil and each way produces a different aroma. Just a sprinkling of a few toasted cumin seeds and dried red chilli on a slice of cucumber turns something so simple into something incredible. Experience has taught me that it’s the use of spices that seems to put most people off cooking Indian food at home so I have created an eBook (available within my app) which focuses on the wonder of spices – how to use them, when to use them, the aromas that they impart and what you can substitute for spices. I love that I am still discovering new spices and herbs every day and it’s incredible. Which is your favourite spice? I actually can’t answer this question – they all have their uses and specialities for different dishes and different cuisines. What inspires you in the kitchen and how long does it take to create a menu (starter, main, dessert)? Inspiration comes from everywhere, I quite often makes notes on my phone about things I’d like to try, or dishes I have tried, ingredients I have seen, conversations I’ve had. There is always something to try. It really depends on the occasion and what I am creating it for – I will usually have one thing in mind that I really want to cook and the rest of the menu falls around that. Sometimes it can be a couple of hours; other times, it can be weeks. Many Indian restaurants have a limited dessert range. I personally would like to see restaurants up their game in the sweet stakes. What do you think of the Indian restaurant scene at the moment? Any areas for development? I think Indian desserts are a difficult one. Traditionally, we have sweets or confectionary which are milk based and they tend to be very sweet. These are usually eaten with a cup of chai. Then there are the more dessert type dishes – kulfi, Rabri, kheer which again, traditionally are very sweet also. I think that many restaurants are, or have done a great deal of work when it comes to the desserts but they have a hard job to do. Firstly, and most importantly restaurateurs know that only a tiny proportion of people will opt for a dessert at the end of their Indian meal. Secondly, they have to create something traditional but for a Western palette. Thirdly, it has to look more appealing than just a ladoo or bowl of rice pudding. Some Indian restaurants are really using classic desserts in a new way and I think it’s fantastic. Using dishes like Bhapi Doi with new flavours, presenting with fruit compotes really works. Designing a classic kulfi with coffee or Western flavours, incorporating chocolate into the dessert menu is a must. Cookery shows like MasterChef and Saturday Kitchen are game-changers; it is now very fashionable to get creative in the kitchen. What do you think of this cooking / baking revolution? I think anything that promotes cooking is a great thing. These programmes are fantastic for getting people excited about being in the kitchen and learning new skills. As a nation, we are watching a lot of programmes about cooking because we want to eat great food from around the world and it excites us to watch cooking at such a high standard. It gives us a glimpse into the exciting world of high-end cooking which very few of us get to see up close. The programmes are all about entertainment which is great, but they miss out on how hard cooking at this standard actually is, and the work that’s required before getting to that level. There is a bit of a void between these and real life but that’s TV. It would be great if this was resulting in more of us cooking from scratch at home but I don’t think it is. If they inspire just a few people to cook and feed themselves good wholesome food without the fads then I think they are great. What I would like to see is people getting back to basics educating their kids at home about food, diet, where food comes from, shopping and get them cooking at home, not on just on TV screens. What cooking trends have you encountered this year? Any new ingredients you can tell us about, that you love working with? There has been a huge shift into plant based proteins and using a wider variety of vegetable in our everyday diets which I think is fantastic. I also think that many of us are making a move back to nature and going back to natural products. Veganism is on the rise as is gluten-free dishes and thankfully processed sugars and salts are becoming more talked about. I think unlike many food fads these are more lifestyle changes which is a better way of approaching diet changes. I’m not one for fad diets and believe that moderation, more fresh fruit and veg, less meat, variety and cooking from scratch are the most important rules to follow. Obviously if you have a medical reason to cut out certain foods or a strong belief, then that is a separate issue. I’m not sure you can call it a new ingredient but a new one to me is the South Indian spice Marathi Moggu. It’s essentially a South Indian caper that is fried to release its aromatic and used in rice dishes. It’s a long dark coloured pod which has the flavour of pepper with a mustard hint and it’s really good. Other ingredients I have enjoyed working with are beetroot which I think is just fantastic. From the colours to the flavours it makes a fantastic ingredient that works really well with spices. From beetroot tikka to chutney to curry and even raita, it’s pretty versatile – they taste great and they are full of lots of vitamins and minerals too. They epitomise the phrase “eat the rainbow” to me! That’s easy – slow cooked mutton curry (on the bone) with lots of roti and a raw onion and chilli salad. Are there any chefs that inspire you, or whom you admire? As a cook, you never stop learning. There is always something that other chefs do, that you think is amazing. I’m loving what Vineet Bhatia is doing at the moment especially with his tasting menu, he is truly inspiring as is Gaggan Anand, and it’s wonderful to see how they are pushing and developing Indian cuisine. I’m more of a traditionalist and love home-style cooking. 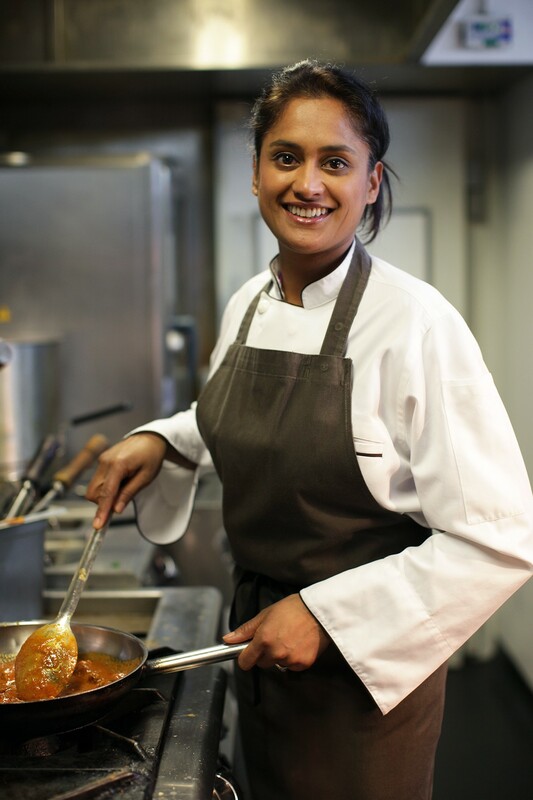 It is just fantastic to see Indian women coming to the forefront in the UK Indian restaurant world, like Asma Khan who has just opened up Darjeeling Express and Ravinder Bhogal at Jikoni. Do you own any cookery books? I love a cookery book as most cooks do and have hundreds, from old school Delia’s Complete Cookery course to Vivek Singh’s Indian festival feasts and even Leith’s techniques bible. As much as I love the digital world, there is nothing more satisfying then leafing through a cookbook for the photography and inspiration. I like recipe books that fulfil a function too, which is why I have decided to publish my first Indian cookery book to accompany the digital proposition. 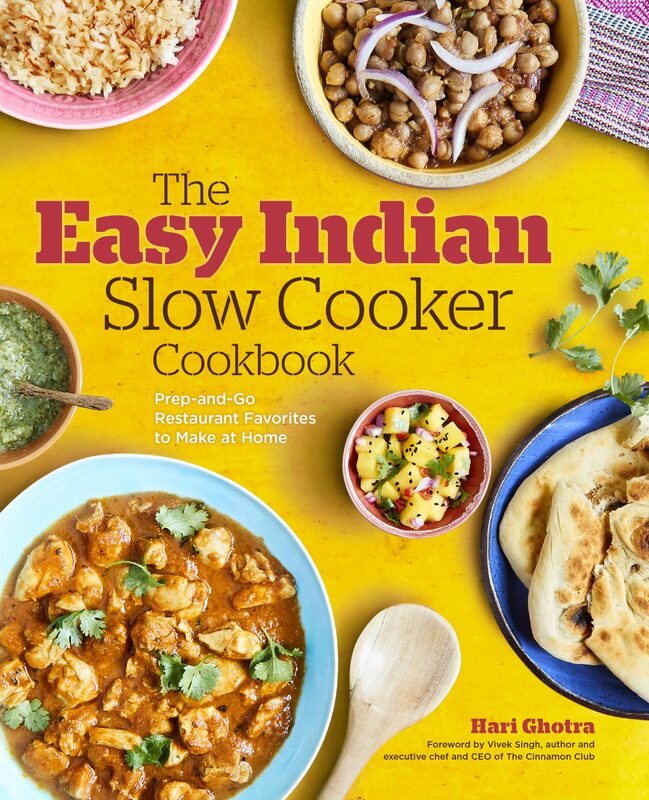 It launches in September on Amazon and is called ‘The Easy Indian Slow Cooker Cookbook’. Research shows that using a slow cooker is coming back with a vengeance because many of us are now wanting to cook from scratch but struggle due to lack of time and the slow cooker fits that bill perfectly. Indian food lends itself perfectly to slow cooking so the two work hand in hand. Here is the link for the book. Food critics – are they friend or foe? I think food is such a personal thing – how can one person judge for another? New restaurants can be broken or made hugely successful on a single review which is a lot of responsibility for critics to have. Running a restaurant or cooking in a restaurant is tough, and chefs are always happy to receive criticism – in fact, they thrive on it. If it helps you grow and develop as a cook or as a business, then I’m all for it. It was a delight chatting to Hari. If you can’t wait to find out more about her (I wouldn’t blame you, she’s one super cool lady), here are few very exciting things she is involved with. Meet Hari at the upcoming Hari Hosts at The Shard (26th September 2017). This is Hari’s monthly panel networking event where experts will gather to discuss specific issues. Hari will be launching her debut book about slow cooking Indian food on this day too (26th September). Hari has also just launched her app.